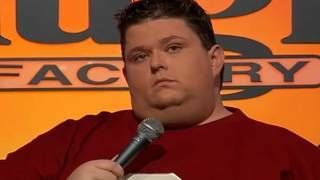 Voted one of Variety’s “10 Comics to Watch,” Ralphie May recently released his record-setting fourth one-hour special for Comedy Central titled “Too Big To Ignore,” proving that his relatable comedic genius is in higher demand than ever. The special is currently available on DVD from Image Entertainment. Later this year, he’ll be releasing a vintage recording on vinyl, taped in Houston, TX in 1998. He will also be coming out with his own line of barbecue sauce called “Fat Baby Jesus” timed for Valentine’s Day.Since his debut on season one of “Last Comic Standing,” audiences can’t get enough of the larger than life comedian. Ralphie has a proven track record of selling out multiple shows in 1,500 to 3,000 seat venues. He has a no nonsense point of view and the ability to connect with a diverse audience by pointing out society’s hypocrisies. Ralphie doesn’t shy away from touchy topics or ethnic jokes, nor does he bite his tongue when society suggests, because he sincerely believes that as long as what he’s saying is true, people need to hear it.Born on February 17, 1972 in Chattanooga, Tennessee and raised in Clarksville, Arkansas, Ralphie was one of four kids raised by his single mom. At the age of seventeen he won a contest to open for his idol, Sam Kinison. He later moved to Houston to develop his comedy routine, at Kinison’s suggestion. “All the comics I’ve ever admired, whether it be Kinison, Lenny Bruce, Buddy Hackett or Richard Pryor, all share a commonality,” says May. “They’re a tour de force. When they speak, there’s no room for rebuttal. They’ve thought it all out. Even the pros and cons of their argument, they raise openly and debate in the midst of their conversation and it’s a beautiful thing to watch.”On the small screen, Ralphie has worked as a writer and producer on ESPN''s “Mohr Sports” starring Jay Mohr and performed stand-up on numerous late night talk shows including four appearances on CBS''s “The Late Late Show w/ Craig Kilborn” as well as eleven appearances on “Jimmy Kimmel Live.” He has appeared on “The Man Show” and MTV’s “Bash” as well as guest-starred on NBC’s “Whoopie.” As if that’s not enough, he’s also one of a handful of comedians to have received a standing ovation on “The Tonight Show w/ Jay Leno.”When he’s not on the road, Ralphie divides his time between Nashville and Los Angeles with his beautiful wife Lahna, their wonderful dog Hoochie Mama, and their two children, April June May and August James May. He contributes much of his time and energy to helping others. Since establishing a residence in Nashville, he has been actively involved with the 100 Club of Nashville, various youth organizations and the Humane Society. For additional information, please visit http://www.ralphiemay.com or his online press kit at http://activepitch.com/profile.php?sn=16f2ec4b706bec570e755a2ab9193e02606f3991.